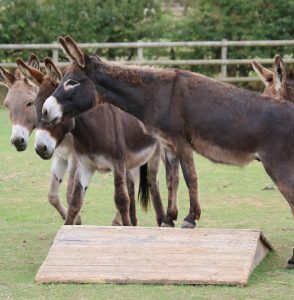 Nipper and the rest of the boy donkey herd have moved to the sand pad as there has been some wet weather. This move was a precaution to prevent seedy toe, as being on the pad where it is drier is better for them. Nipper was also pleased to realise that this meant he was allowed some extra food at tea time in order to help maintain his weight while they were not eating the grass in the field! Nipper has been typically himself this month basking in all the attention from half term visitors and getting up to mischief. He is extremely happy that he is now allowed back in the field full time with his friends, Chocolate and Sooty. Although the pair were enjoying the peace and quiet, we think they are secretly pleased for Nipper’s return to the field and his usual antics resuming. What a superstar little Nipper has been! The farrier has been keeping a regular eye on his feet, and this has worked wonders for Nipper who has had top marks! So, he is delighted that he has been allowed in the field for a couple of hours with his best friend Ronnie to celebrate. Nipper like his other adoption animal friends has loved meeting all of the visitors throughout December, especially when they give such good cuddles and bottom scratches. In order to monitor his foot condition, he is being seen by the farrier every 3 weeks throughout the wet and cold weather. 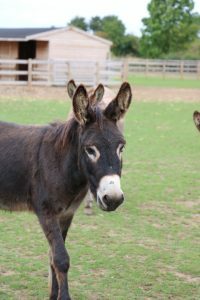 Last year a couple of his donkey group suffered with ‘seedy toe’ and by monitoring their feet regularly, it will hopefully prevent it from happening again. 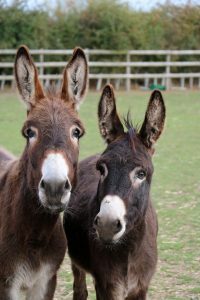 Nipper and his good friend (and partner in crime), Ronnie have been caught stealing all the limelight when a potential fosterer came to visit other donkeys looking for a new home. 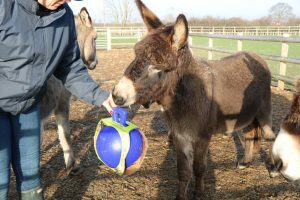 In true Nipper style, he would not let any other donkey have a look in with these new visitors and he was potentially trying to bag himself and Ronnie a new home. Thankfully, their plan was soon put to stop and the rest of the donkeys were introduced. 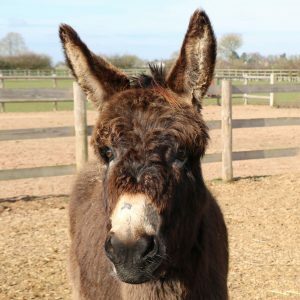 In his last update, Nipper was growing up fast and was looking more adult every day, however Ronnie seems to have had a growth spurt and has taken over the as the winner of the tallest donkey between them! Nipper’s supporters would never think he had surgery a couple of months ago, not only is he full of himself but the scar has nearly disappeared completely! Nippers coat is growing thicker for winter and he is looking very grown up as well. 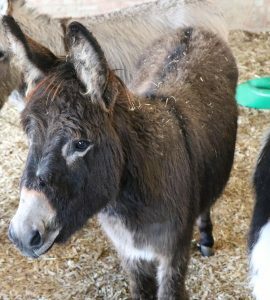 Nipper must be feeling very grown up too, as staff have noticed he is getting a little bossier with the other donkeys and trying to take charge, although he is still the trouble maker of the group! Nipper’s new big-boy coat is growing thick ready to keep him warm for the winter. Although he was sad that the summer holidays were over, the Autumn Fayre soon came around where he could yet again meet his adoring fans, which thankfully cheered him up. He has also had a visit from the vet this month who said his nose had completely healed from his sarcoid surgery and he got the all clear- well done Nipper! 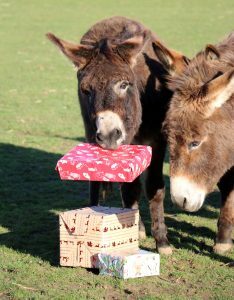 Nipper celebrated his 3rd birthday this month, which involved a little party with his donkey friends and cake, although he only received one cake from his supporters this year. 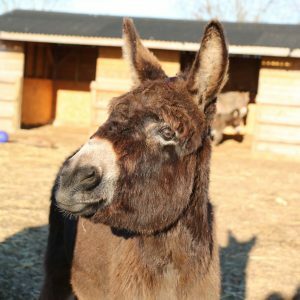 He has now lost all his fluffy baby coat and is looking like a handsome grown-up donkey. 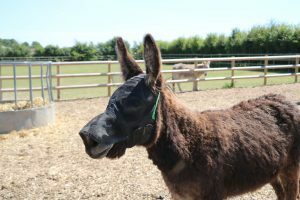 He no longer needs to wear his fly mask as the wound on his nose has heeled very well, this is a relief to staff who had to find the mask every morning when he had successfully removed it over night! 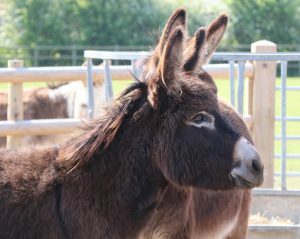 Nipper has once again been the centre of the all the mischievous goings on in the donkey herd! Not only is he pulling off his fly mask, he is letting Ronnie pull it off too and getting him into trouble. Nipper’s nose is healing very well and he isn’t shy at showing everyone he sees the healing wound. 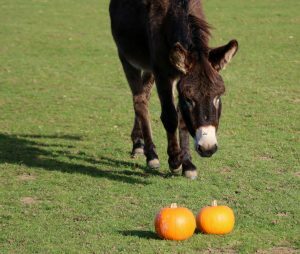 He has found a new friend in Chocolate the donkey who Nipper is trying to get involved in the trouble making, but thankfully Chocolate is having none of it. Nipper has had lots of attention this month, but unfortunately it was from the vet. The decision was made to remove his sarcoid from the end of his nose and he had his surgery a couple of weeks ago. His sarcoid was lasered off successfully and he then had cream and pain relief administered to help with the healing process. He has loved the extra attention and cuddles from staff as they monitored his wound. He has also been enjoying the heatwave but needed a bath on a couple of occasions to help cool him down at the hottest part of the day. Unfortunately, Nipper’s wart has had a slight change and became very sore for him so he had a visit from the vet. It was decided it was a sarcoid and he is booked in to have it lasered off in the near future. He is very much enjoying the extra attention from staff and vets coming to see him and of course his best friend Ronnie is still at his side giving him moral support. Nipper has had a visit from the vet to examine a wart on the end of his nose. He has had the area clipped and staff are now monitoring it for any changes. Ronnie is never far away from his best friend and has been watching on and looking after Nipper when the vet visits. 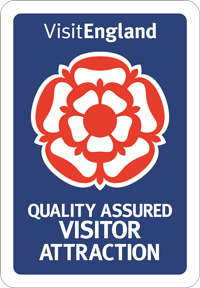 Nipper is looking forward to returning from to the Visitor Centre to meet his supporters over the summer. Nipper has a new friend called Rico. 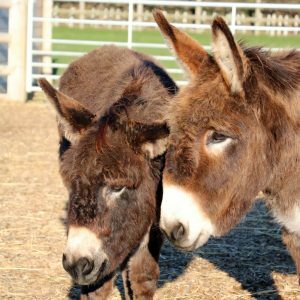 Unfortunately, Rico had an impaction colic episode so Nipper is keeping a close eye on his new buddy to make sure he is OK. Nipper has also moved with some of the other donkeys to Walklands Farm for the winter in order to help staff manage their seedy toe. He is also enjoying playing with the fibre blocks that were kindly donated by a generous supporter, they are keeping him busy and out of mischief!